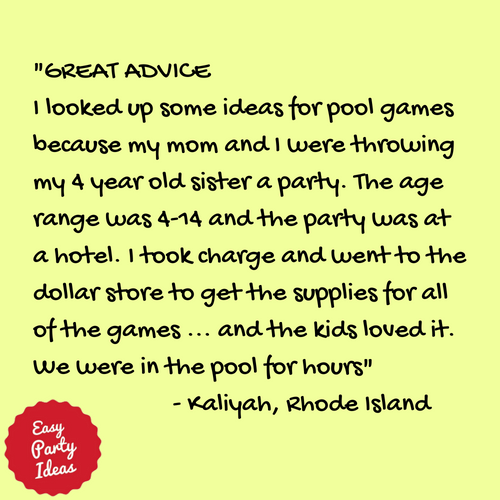 You don’t have to have a pool to have fun (although there is a great collection of pool party games listed here!). Sometimes just playing with water is just fine. The pages linked below are to games that are great to play at the beach, in your backyard, or at a pool party! Warn guests that they’ll be getting wet. If wearing swimsuits is an option, let them know that up front. Sometimes games with water are great to do after a party where you get really messy. Think of having a painting party, or an arts and crafts party. Other times it is fun to just let everyone get together and splash around in the water, without having anything organized. If this is the direction your party is going, be willing to be flexible and “go with the flow” so to speak! Lastly, remember that anytime water is involved, surfaces can get slippery. Take whatever precautions are necessary to keep you, your guests and your property safe while playing these fun outdoor games at your next party. Keep cool...and play safe when playing these fun party games! Water Relay Races - These games all involve playing together as teams in a relay style race! Fun and Exciting! Water Balloon Games - These water balloon games all involve water balloons or water-filled sponges. A great way to cool off! Water Gun Games- Ready...aim...fire! Water gun games are always a hit, especially if you have lots of space in your party area. More Fun Water Games! - Don't forget these fun games. Some of these are also enjoyed by our youngest water fans. Pool Games - If you have access to a pool, you won't want to miss our list of pool games!